Why are California charter schools' vaccination rates so much worse than district-run schools? 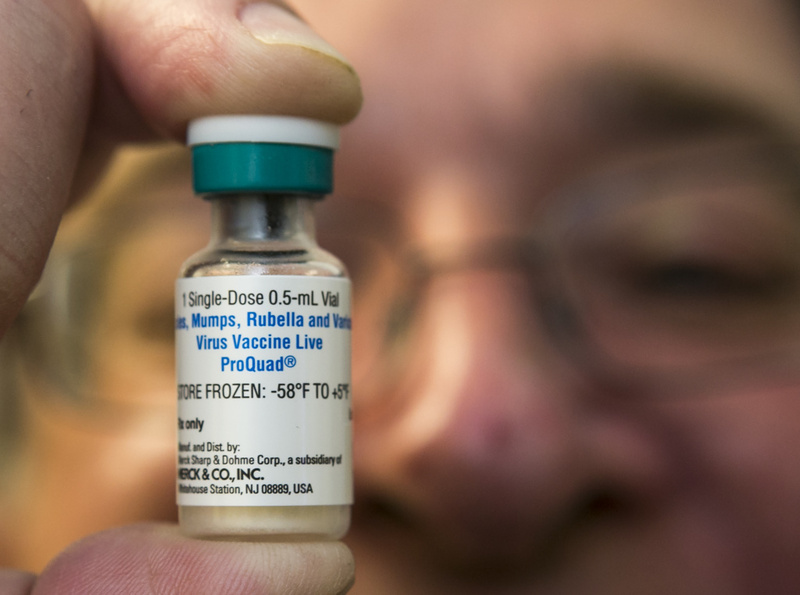 FILE - In this Thursday, Jan. 29, 2015 file photo, a pediatrician holds a dose of the measles-mumps-rubella (MMR) vaccine at his practice in Northridge, Calif. When a particular group of parents call Claudia Weintraub asking for a spot in her school, they don't speak in code. They're not coy. They're honest. "They call me," Weintraub said, "because, they say, 'My child isn't fully immunized and I can't go to a traditional school.'" Weintraub is the director of River Oaks Academy, an "independent study" charter school in Ventura County. It's essentially a publicly-funded homeschooling program, with 260 students, a dozen roving teachers and physical locations in Westlake Village and Oxnard. Independent study charter schools, like Weintraub's, have taken on a new appeal for parents who oppose mandatory vaccination. Last year, after California's new, stricter immunization law took effect, parents could no longer simply obtain a "personal belief" exemption to enroll their unvaccinated child in school, public or private. And unless the child had a legitimate medical reason not to be vaccinated — or, at least, a physician willing to sign an exemption — or a special education plan, the rule was "no shots, no school." But the law exempted students who didn't receive classroom-based instruction, making independent study programs like River Oaks Academy among the only options left for an unvaccinated child to receive publicly-funded schooling. The statewide impact of this exemption is evident in the vaccination data from the 2016-17 school year. Because so many independent study programs operate as charter schools, the homeschool exemption appears to be one major reason why public charter schools' vaccination rates tend to lag significantly behind rates in traditional, district-run schools, a KPCC analysis of that data found. Weintraub is in an uncomfortable spot. She believes in vaccination; all three of her own children received all their shots, she said. And if parents choose homeschooling for the wrong reasons, she said, there's a real danger that "the student doesn't learn." "I can say to them," Weintraub said, "'Look, from what you're telling me, I don't think we're a fit … You really don't want to homeschool your kid. You're telling me you're working all day, so how are you going to homeschool?'" But legally, there's only so much Weintraub can tell these parents. As a charter school — a term for a publicly-funded school run by a non-profit entity, not a school district — state law binds River Oaks to accept any student who applies so long as there's space. "My hands are tied at this point," she said. "The law says I need to take them. They need to go somewhere." How big is the gap, district-run vs. charter? For several reasons — the homeschool exemption being one of them — unvaccinated children appear to be ending up disproportionately in charter schools, the KPCC analysis showed. Immunization experts say it takes a vaccination rates of around 95 percent to protect against diseases like measles or pertussis, often known as "whooping cough." Crossing this threshold is often known as achieving "herd immunity," a level of immunization sufficient to not only stifle outbreaks but also protect medically-fragile community members who are unable to receive vaccines themselves. In seventh grade, the vast majority of California's district-run public schools had crossed this threshold; 96.8 percent of schools enrolling seventh graders reported enough students were fully "up-to-date" on their shots to cross this herd immunity threshold. But in only 73.6 percent of charter schools were most seventh graders up-to-date on their shots. 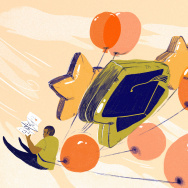 The numbers among entering kindergarteners were even worse for charter schools. First, consider how many schools had 95 percent of kindergarteners who had either received all their shots or who were not yet due for a required dose: 92.1 percent of all district-run schools met this threshold, compared to in only 70.8 percent of charters. Even adding in kindergarteners exempted because they're homeschooled or because they have a special education plan does little to narrow the gap, as shown in the chart below: 93.1 percent of district-run schools, versus 75.9 percent of charter schools. In the broader scheme, these gaps have not dampened vaccination advocates' enthusiasm over California's immunization rates. This year, California's vaccination rates set new highs. Fully 95.6 percent of kindergarteners received all of the required dozen doses — the highest immunization rate state public health officials have reported since 2001. In seventh grade, 98.4 percent of students had received their pertussis booster, also a five-year high. It also is worth noting that vaccination rates among private schools — which are not exempt from vaccination laws — have trailed public school rates for years. One in four California private schools didn't even report their 2016-17 data. Still, some vaccine experts questioned the need for an exemption for homeschooling. Allowing parents to take advantage of such exemptions "puts not only their child at risk, but the community at risk, and I think it shouldn't be allowed," said Paul Offit, director of the Vaccine Education Center at the Children's Hospital of Philadelphia. Offit pointed out homeschool children are likely to be in touch with other kids, "assuming that those children aren’t in living at home in a protective bubble, assuming that they do go out and go grocery shopping with their parents, or go to the mall with their parents, or go to a public swimming pool with their parents … "
"The notion," he added, "that [homeschooled students] are living in a sequestered situation is, I think, a false one. Of course they're going to be exposed to other children." And even within California's independent study programs, children aren't spending their entire learning day in their homes. At River Oaks Academy, for example, Weintraub said students have the option of taking classroom-based courses at the charter school's physical locations. Some River Oaks students, she said, spend a few hours a week or a whole day per week in classroom-based instruction. "The fact that they get together is concerning," said Walt Orenstein, a professor of medicine, pediatrics and global health at Emory University, "because should one of those kids be sick, they can transmit to lots of other kids who, in turn then, can then transmit in their own communities. That to me, is the concern, the clustering of susceptibility is the risk." But one of the architects of California's new, stricter vaccination law, SB 277, defended the homeschool exemption. "We can’t punish the children for the errors of their parents," said State Senator Richard Pan (D-Sacramento), a practicing pediatrician and the law's co-author. "Most parents are trying to decide what’s best for their families and for their children," he added. "Sometimes, unfortunately, because there are people actively spreading misinformation, they’re making decisions based on bad information. To a certain degree, we can't punish their children by denying them an education — that would be both unconstitutional and immoral." Pan is focused on another factor: vaccine advocates believe there are physicians who are giving out medical exemptions to children who don't really need them. "There is a very small minority of physicians," Pan said, "who have seen this as an opportunity to monetize their license to provide inappropriate medical exemptions because there is a demand by some of these parents who are willing to pay." 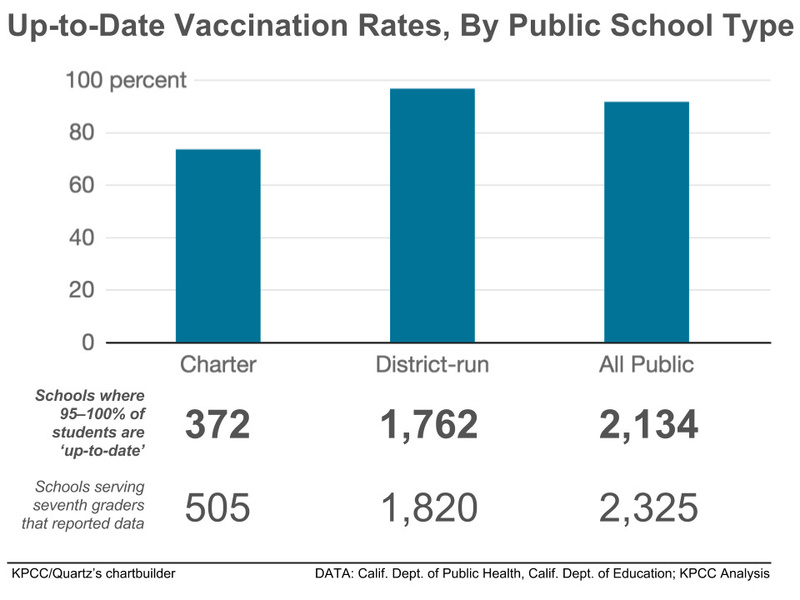 Physician-generated exemptions appear to explain much of the vaccination gap between charter and district-run schools, according to KPCC’s analysis of the 2016-17 vaccination data. In almost all district-run public schools, between 0 and 10 percent of kindergarteners received permanent medical exemptions; out of more than 5,000 district-run schools, only 3 were exceptions to this rule. 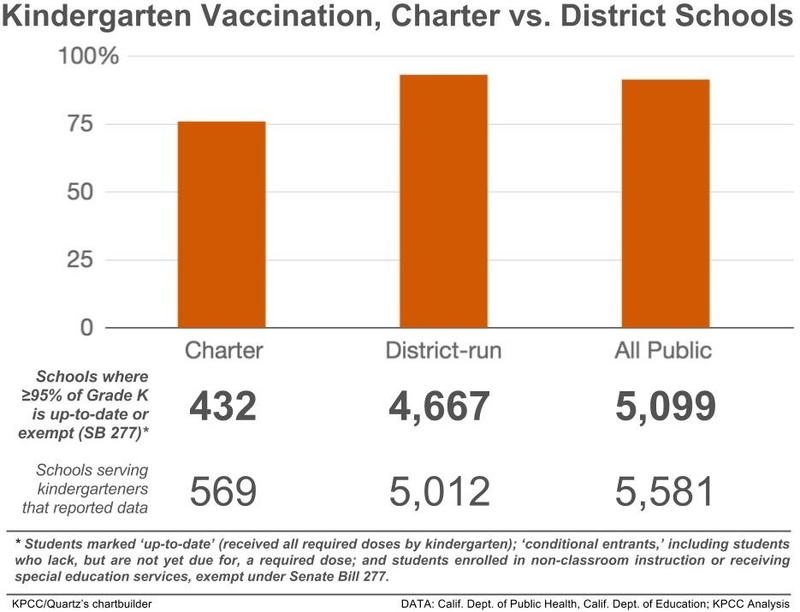 But KPCC identified 26 out of 569 charter schools with permanent medical exemption rates among kindergartners topping 10 percent, leaving open the possibility that these schools have become pockets of low herd immunity that Pan was hoping SB 277 would stamp out. Catherine Martin, head of the California Immunization Coalition, suspects some charter schools are attracting parents who "may have more resources to seek a medical exemption with a physician that is more — I think the nice way to put it is, more flexible about their review of immunization status." 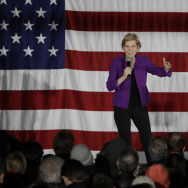 "Basically," as Martin told KPCC earlier this month, "they may have resources to pay a physician to provide them with the medical exemption that they seek." Pan said officials with the Medical Board of California and the Attorney General's Office need tools to better-regulate these exemptions. He left open the possibility that this could be an area for future legislation. The new immunization laws leave the school's director, Claudia Weintraub, an ardent advocate for homeschooling, conflicted. At River Oaks Academy, 14 out of 28 seventh graders were not up-to-date on their vaccinations in 2016-17. River Oaks reported kindergarten data, but because the school enrolls fewer than 20 kindergarteners, the state does not publish a vaccination rate for that grade level. "I really would rather not have families not be driven to my school for the sole reason that they can’t go anywhere else because of immunization laws," she said. But ultimately, Weintraub agreed with Pan: "There needs to be one option for these kids where they can get [public] schooling." "Is it ideal? I don't think so," she said. "But I have a feeling these families will not immunize because the proverbial gun is put to their head."